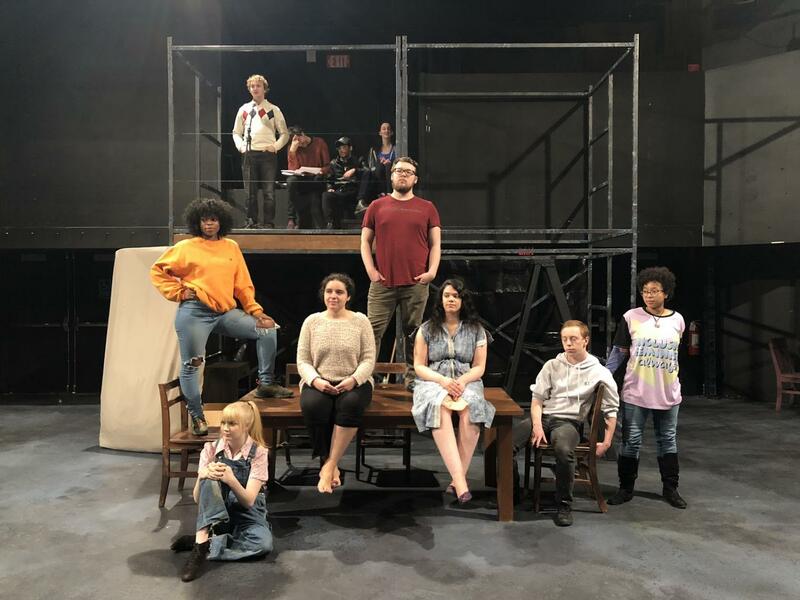 AMHERST — With a cast of merely 11 students, “What of the Night” gives each of its actors their well earned time in the spotlight. Ranging from freshman to post-grad students, this cast of mostly theater majors is not one you will want to miss. Falling under the genre of drama, this show explores themes of “class, race, gender and violence in general” as described by Celena Lopes, a junior English major. The unique setup of the play emphasizes the importance of each and every character and allows time for the actors to explore and express themselves within one. Divided into four separate plays, “What of the Night” truly does have 11 main characters throughout its course. While during the first play, it may be senior theater and communications major Tyler DiBenedetto’s character Pete, in the second play, the focus shifts to freshman psychology major Michaela Kelly’s character Rainbow. Despite the radical change that occurs from one play to another, the cast had trouble deciding which scene they were most excited for the audience to see. 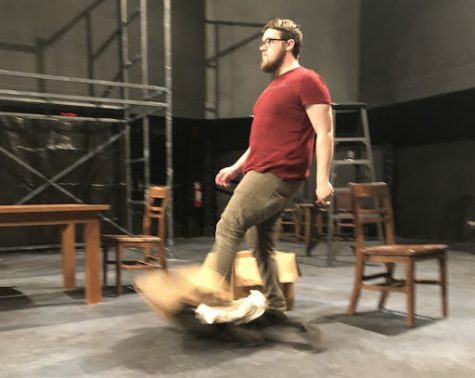 Senior marketing and theater double major Lucas La Guardia is most excited for the audience to see “the first scene of the whole show, between Pete and Nadine.” Meanwhile, freshman theater major Noah Bailey preferred the last play for its “avant-garde” nature. The “humanity and struggle” that CiFuentes speaks of was not an easy process for the actors to portray, however. Many admitted that this production was different from anything they had done in the past, in more ways than one. While CiFuentes pushed himself “to the next level” with a new type of character, Kelly was challenged by the emphasis on movement and body work rather than constantly emoting. Overcoming these challenges only became more important when Maria Irene Fornes, the playwright for the show, passed away. On Oct. 30, at the age of 88, Fornes died of Alzheimer’s disease. This was right in the middle of rehearsals and preparations from the upcoming performances of “What of the Night.” The immense effect of not only her passing, but the life she lived and shared through her work, is evident in what the cast had to say about her passing. Alison Butts, a sophomore theater and communications major, connected to Fornes’ passing because her grandfather also passed away of Alzheimer’s disease. She is doing this play not only in honor of Fornes, but for her grandfather as well. There will be a free screening of “The Rest I Make Up,” a documentary about Maria Irene Fornes, on Dec. 3 at 4 p.m. in Herter Hall room 231. The documentary will be followed by a question and answer session and reception led by Michelle Merman, the filmmaker and Migdalia Cruz, a former student of Fornes. The whole cast, with the exception of one student who has class at the time, will be in attendance. To see the cast in action, tickets can be purchased for Nov. 29-30 as well as Dec. 1 and 5-8. All shows begin at 7:30 p.m. and take place in the Curtain Theater. Along with the night shows, there is a matinee offered on Dec. 8 at 2 p.m. Tickets run for $5 for students and seniors and $15 general admission and can be purchased at the Fine Arts Center Box Office or online at the FAC website. This show is likely to sell out, so grab your tickets while you still can!